Are you looking for winter decorating ideas for your home? You have come to the right place! Decorating after the holidays calls for a fresh start and these ideas will work no matter your style! After the tree comes down and the last of the glitter and tinsel is swept away it’s nice to have a clean slate and fresh decorating ideas. And doesn’t it feel great to have a fresh new start? 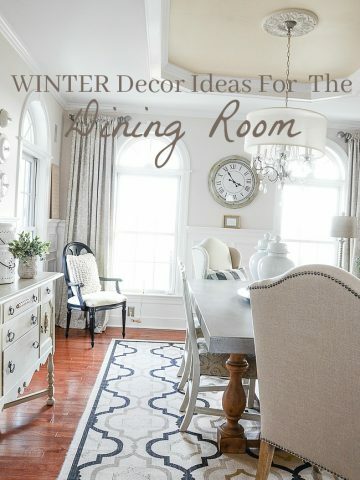 Winter is the time to strip down our decorating and add in lots of soft texture and warmth! I’m sharing my winter family room with lots of easy decorating ideas that will work for any style. 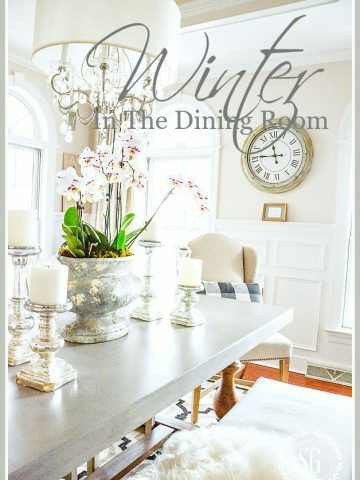 You don’t need a neutral color palette like mine to make these winter idea work!!! After the holidays most of us want to take our decor back a notch… or twenty! That often means editing what we have in a room. Layers of decor and accents do make a room interesting but coming off of holidays where we usually have an overload of layers it’s nice to pare things back a bit and go for subtle layering and a warm relaxed look. Take three things out of a room. Living room, family room, dining room? Start there and take out more until your room feels lighter and more comfortable. Take off a layer of pillows, remove and rearrange things in a vignette. Remove things from a bookshelf and rearrange it. Little things make a big difference! Does editing make for a more restful room? In the family room I edited the vignette on the coffee table as well as worked to create a more calm look on my bookshelves. What a difference! Winter is the time to truly make your fireplace the focus of your decor. Even if you live where it is still warm a pretty hearth and fireplace is a must! Don’t have a fireplace? Don’t worry. Make any flat surface the star of a room! Use the same accents below and incorporate them to work on top of a table, buffet or even a shelf! I really stripped down my fireplace this winter. I love the restful look. When we have a fire the focus is on the pretty burning embers and not lots of decor! Adding a mirror to your room will let the natural light bounce around your room by day and the candlelight do the same at night. We all need more light in the winter! Think about adding a large leaning mirror against a wall. What a great addition! Or switch out a painting or wall decor for a mirror. I took down the large mantel clock and replaced it with a big round architectural mirror. Pillows are my go-to in any season, but in the winter I want them to look and feel very textural and soft! This winter I’m selecting my pillows carefully. Texture and a soft look are my two main requirements. I think everyone should have a few Mongolian pillows. They create beauty and check all the decorating boxes! You can find Mongolian pillows in almost any colors. Using lots of candles is a favorite here at StoneGable! And lots of candles in every room. When the sun goes down the candles go on! And I’m a person who really misses long evenings with sunlight. Candles are a great diversion and so so pretty! Most of us have lots of candlesticks and candleholders. Get them out. I prefer to use battery operated candles in rooms I’m not immediately in. and I opt for ones on timers! 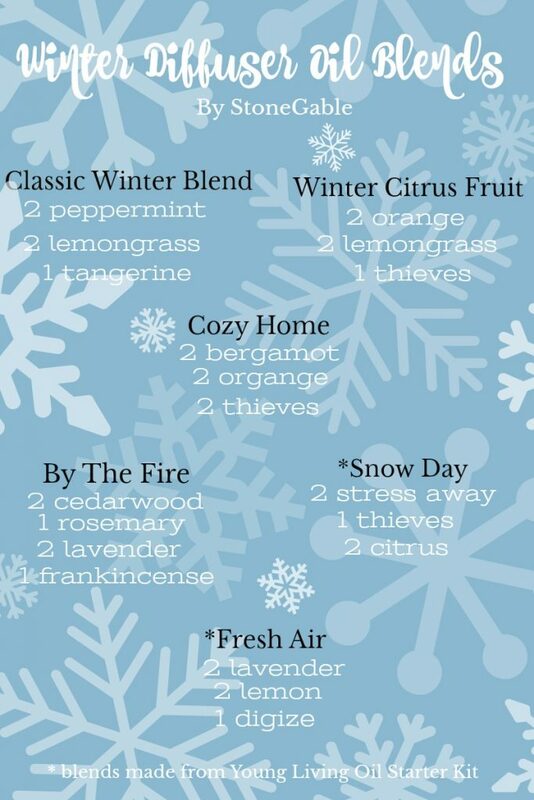 Let your home take on beautiful aromas that work with winter. Warm cedarwood and zesty citrus. I diffuse scents at StoneGable to lift my wintry mood as well as my spirit! 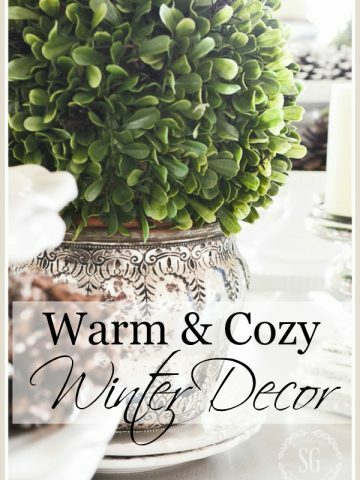 Whether faux or real a green plant or a vase of flowers is a must have during the winter. Add something organic to every room. Of course, it is not for just winter! Every season and every room can benefit from something organic! One of my very favorite “winter” plants here at StoneGable are orchids! I look at them as very long term cut flowers. Their blooms can last a couple months. Then I get rid of the plant. But if you have a green thumb you might like to keep it and coax another stem of beautiful blooms from it. The Staghorn fern in the bookshelves are faux but this little bit of green makes such a difference! 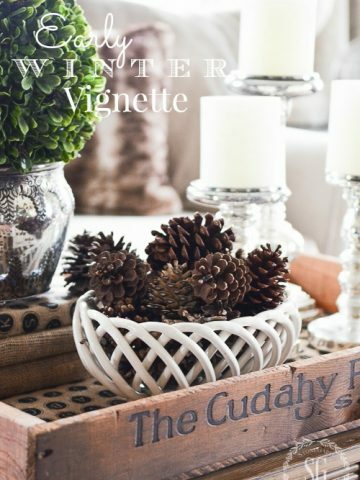 The winter months can be long so let’s lets cozy up in winter decor! I love how you mix textures. The baskets on the bookshelves are a great touch and must be handy for storage. Lovely room. I would like to know if your chairs by the fireplace are blue and white or black and white? Hi Margo, the chairs are blue and white. Dear Yvonne, My husband and I just move into our new home and this week ordered our living room furniture. Over the past several years I’ve closely studied your blog, so we decided to purchase two knuckle chairs, like you have in your living room (slightly different color). Can’t wait for their arrival!! Congratulations on your new home, Lois! May you and your husband be blessed! Love these ideas, Yvonne… you are always inspiring, sweet friend! I love your attention to details for your Winter decor! Could you tell me where I could purchase the pillowss you have on your couch? Its the ones with kind of a snowflake design. Hi Connie, when I bought the family room sofa I had the pillows made for it. Sorry, I don’t have a source. These are such great ideas! I especially love those fluffy white pillows. They look so comfy and cozy for Winter. Wow – we are on the same page! We have large battery operated candles in 4 rooms plus our foyer – they are displayed in a variety of ways – in clear tall simple vases, in lanterns, and some are actually sitting inside 2 tall crystal snow people on our dining room table. Our mantle this year was more seasonal than Christmas – lots of white, candles, green trees with white “frosting”, and a rustic church with a candle inside. We will leave these items up until almost Easter – depending on the weather here in the northeast. These candles are a full time job for my husband, but he enjoys it. I am on the hunt for a large mirror that looks like a window for my living room. It will replace an antique mirror that I have pictures of our flower garden and gold ceramic leaves on plate hangers on either side. It is still very pretty, but now I want a simpler look. Good Morning! I’m interested to know where you purchased the side table appearing under your window. It looks like it folds out, which would be great for entertaining. Love the color — worn wood and white. Thank you! Love your winter decorating. A question… where do you plug in your oil diffusers??? And how many do you use throughout your home??? Great question, Ester! I plug in one on the bar in the breakfast room between my kitchen and family room. One in my study where I work and one in our master bedroom. I can diffuse different scents because they are in different parts of my home. Hope this helps. Can you tell me about the beige rug in the living room?! So helpful. Just what I needed to read today. Thank you. I love a of the winter neutrals that you use. They look good with metalics, too! You never cease to amaze me. I love candles and have been meaning to get some of the battery operated ones. Yours always look so beautiful. I love your decorating style and the decluttering for Winter is one of your best. I simply love your candlesticks on your mantle. Can you tell me what heights they are? Thank you so much and Happy Thursday!!! Hi Kathryn, I found some of these locally and a trio at Balsam Hill. Look online for those. They really are a mismatched whatever was tall blend! LOL! 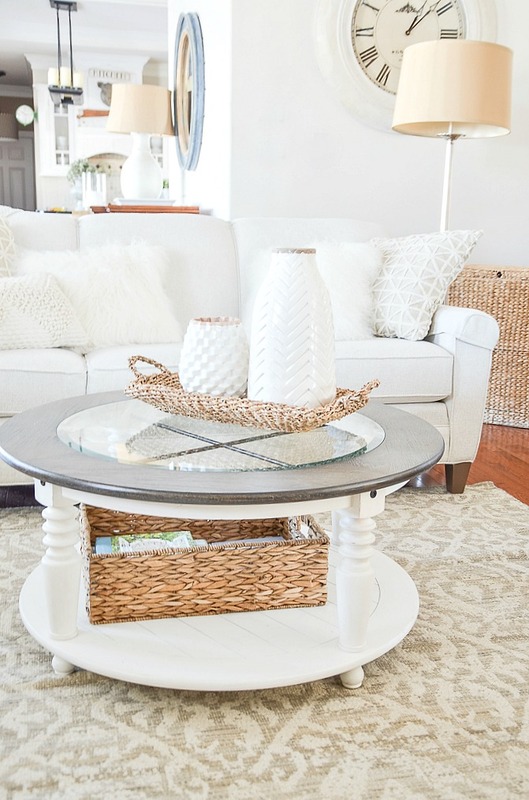 I love the galvanized/glass lamp on the side table. Can you tell me where you got it? Hi June, I found it at Hayneedle. Look for it there. I love your new approach to less is more! The mirror over the fireplace is perfect. Bookshelves are calm and refreshing to the eye. I think you should add a little more blue accents in your family room. Hi Bev, this winter I wanted lots of white. As spring and summer come to StoneGable I will be adding a little more blue! Thank you Yvonne for another spectacular post. I like your chunky candle holders. I am always looking for more to add to my collection. The battery candles with timers are the best. I’m so glad that StoneGable is motivating you! Do what you love! I enjoy the shape echo of the mirror with your new round coffee table. It is so good to change things in our homes seasonly to let us have a new outlook on decorating. I like to think of winter as my time to renew my spirit, rest my body and refresh my suroundings. We all need this. I have an old mirror I would like to paint the frame……what color is the mirror frame in this picture? Thanks for all your helpful tips. I enjoy your ideas! Hi Jane, painting a mirror all depends on what you have in your room. I’m such a fan of silver leaf. Have you ever thought of silver leafing?